I didn't want to like it, but I kinda do. 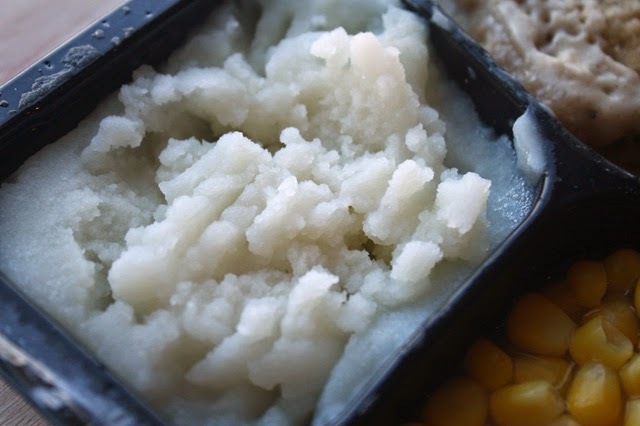 You'll get your weekly salt requirement in this one frozen meal by Banquet. And, too much ground black pepper here is welcome -- that I can easily handle. 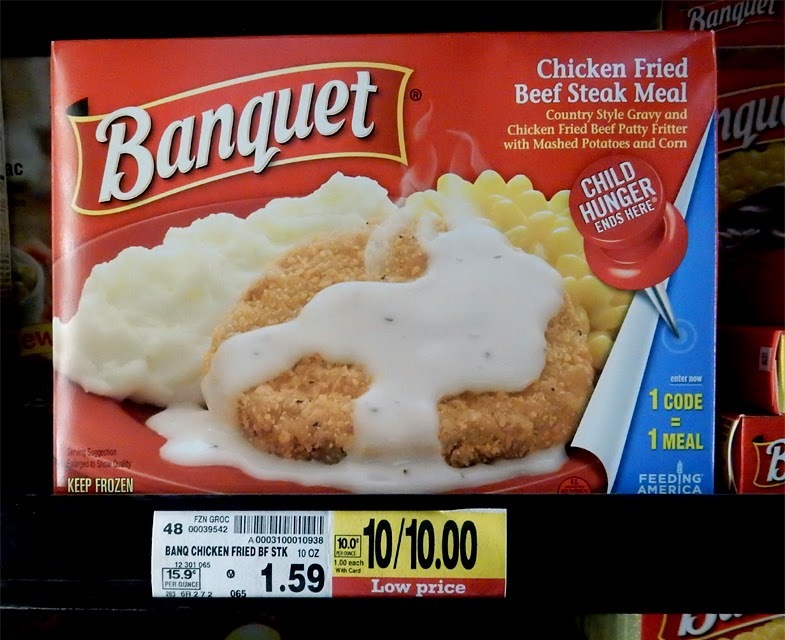 I get this Deal of the Day, Banquet Chicken Fried Beef Steak Meal, at my local Ralphs for a buck apiece, with my grocery store card. I've also seen a Banquet Chicken Fried Chicken Meal made with chicken, instead of beef. 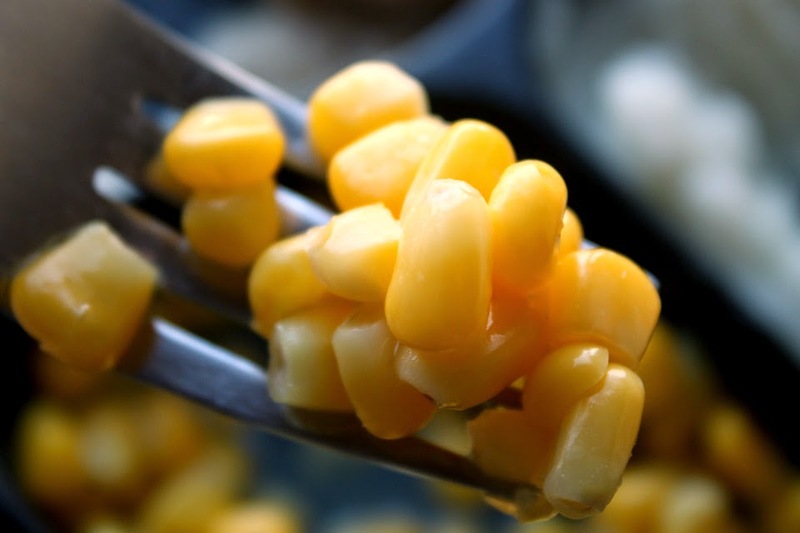 It's a schizoid meal, tasty sweet corn and so-so mashed potatoes; nice crust with a too-thin beef patty; and rich creamy milk gravy that's too salty. 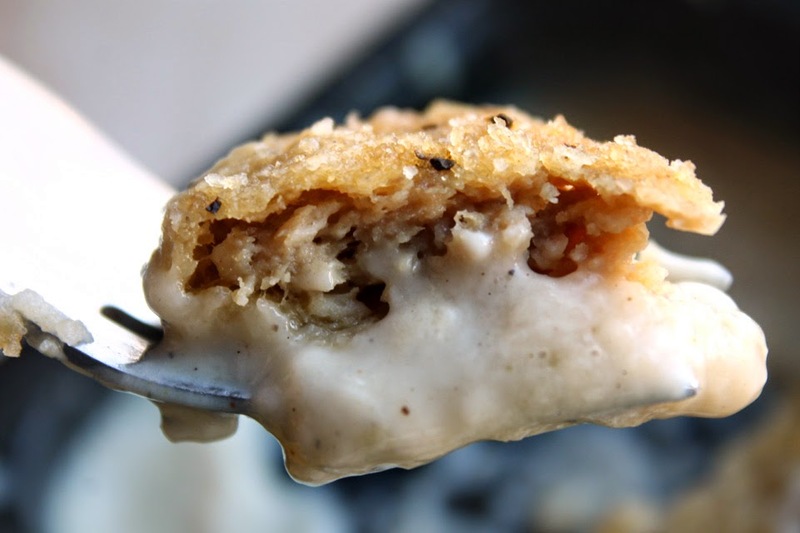 I have a recipe here, that's easier on the taste buds, and lighter, too, as it's made with low fat ground chicken. Biting into this meal for the first time is like chewing on a salt lick. It satisfies the paleolithic part of the brain's sodium craving. (Although after a couple of these meals, the salt is less noticeable.) The fresh frozen corn is there to help balance this out. It's sweet and tender and is a highlight to this meal. The potatoes are dull though - no texture, just a mushy tasteless carb. It's main function is to sop up the tasty cream gravy. Maybe a little veggie texture, with butter flavoring, would help? 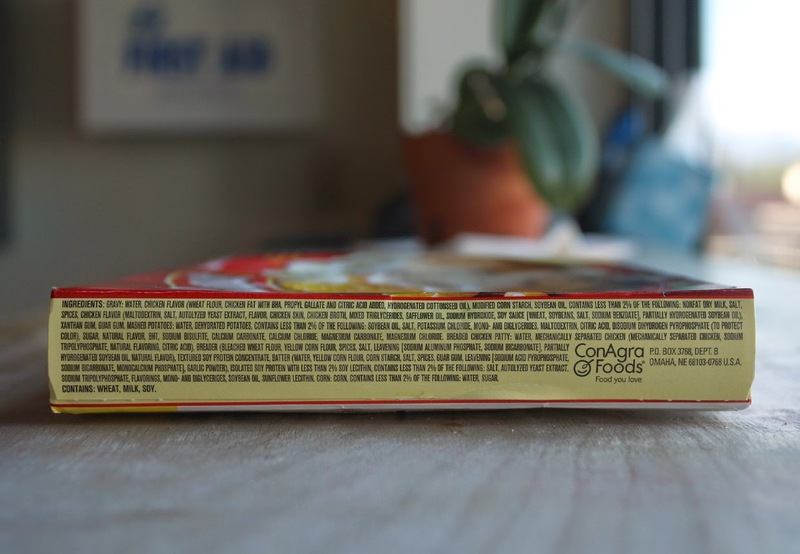 The way too long ingredient list may put you off, but if you can look past it, it's an okay meal -- every once in a while. While the meat patty is thin, the crust is thick and quite tasty. It even holds up after micowaving. 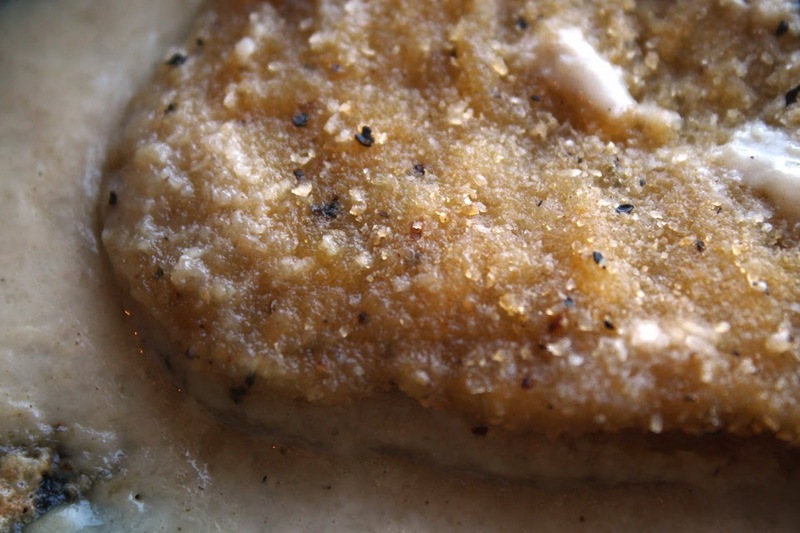 While over-seasoned, that's normal for many Southern recipes and frozen fare. 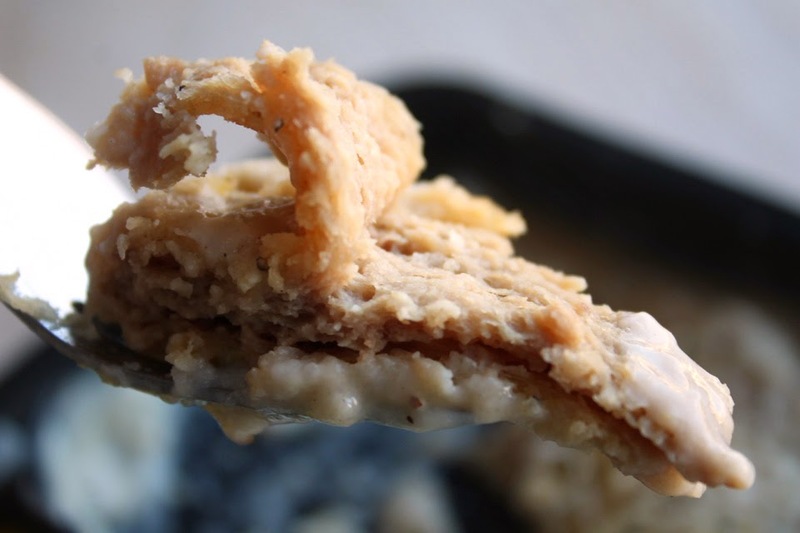 Chicken Fried Steak is a staple there, like fried chicken, except with a cheap slab of round steak, that's been pounded and fork-poked to tenderness. And the cheapest substitution is using ground beef or chicken, like here. Chicken Fried Steak is believed to have originated with German and Austrian immigrants to Texas in the 1800's. If you've had Wiener Schnitzel before, then you'll notice the similarity. And it's always topped with cream gravy and there's plenty of it here. The gravy is over-salted, but flavorful. You'll dip the potatoes and battered steak in it, to get every last drop. I wouldn't eat this too often, especially, if your salt intake is restricted. 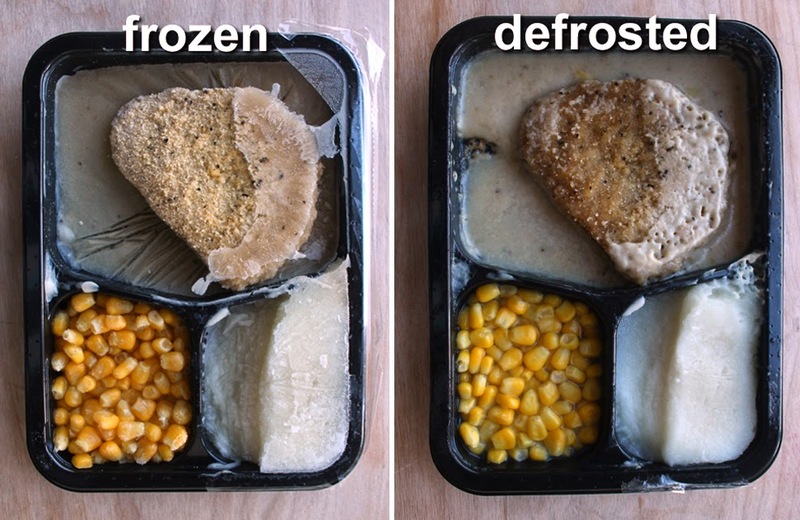 So, how does Banquet Chicken Fried Beef Steak Meal rate on my cheap$kate dining scale of 1-9, 9 being best? Well, I give this Deal of the Day a guilt-ridden 7. There are problems, but I will probably be back for seconds - at least, until the heart doctor warns me off it! If you are an ex-Southerner missing Chicken Fried Steak, then try it out; but if you live in Texas and have access to the real thing, then this meal will have you taking up arms in front your local grocery frozen case, crying foul, shouting "Remember the real Chicken Fried Steak!"